Former Southampton season ticket holder Sam Vokes scored his third goal in as many games at St Mary's to push the Clarets in to sixth spot in the Premier League. The substitute's 81st minute winner was his third of the season following on from his brace against champions Chelsea at Stamford Bridge on the opening weekend of the campaign. The 28-year-old had watched his boyhood club beat Liverpool at Anfield on their way to the EFL Cup final last term but he went from Saint to sinner in Hampshire when heading home Johann Berg Gudmundsson's cross. 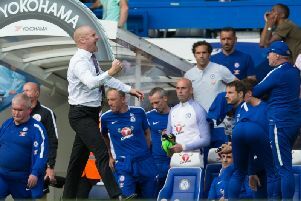 The Welshman, who had replaced record signing Chris Wood in the 65th minute, said: "Obviously when you're on the bench, reading the game, seeing how it goes and the gaffer brought myself and Barnesy on. We maybe changed the way we played and took it to them a bit more and we got the goal in the end. "It was omething we worked on. It was something we worked on. It was mentioned a lot last year our away form and you see this year that we're going to these places and taking it on and getting the points we deserve." Burnley boss Sean Dyche was the more ambitious when introducing Ashley Barnes, who replaced Jeff Hendrick, alongside Vokes in a double change to go 4-4-2. Meanwhile, the Turf Moor chief's opposite number Mauricio Pellegrino withdrew leading scorer Manolo Gabbiadini for former Clarets striker Charlie Austin in a like-for-like change. There was nothing to separate the sides prior to that, though goalkeeper Nick Pope made a number of vital saves to secure his fifth clean sheet in the top flight in 675 minutes of football. Sofiane Boufal tested Pope with a volley in the first half before making a divine intervention to prevent Nathan Redmond from opening the scoring. Defender James Tarkowski also added to his impressive tally of blocks this season to stay top of the charts when throwing himself in the way of Ryan Bertrand's attempt. Burnley's only offerings in the opening stanza were two attempts from Gudmundsson, with both failing to hit the target. Pope continued his impressive form, which earned a nomination for October's Premier League Player of the Month award, when producing a simply outstanding save to deny Maya Yoshida after Gabbiadini had earlier glanced wide from a Cedric Soares cross. Vokes's winner was a trademark header from 12 yards out after Gudmundsson had cut back to swing the ball in to the box and Fraser Forster had little chance to save. The Clarets move in to the international break in sixth, currently level on points with fourth place Chelsea.